It’s almost exactly on the opposite side of the world but, unlike Brazil, it is far from the world’s attention. West Papua, however, has not forgotten that the Football World Cup is on. Far from it. Fighting for independence from Indonesia for 46 years, this province that makes up the western half of the island of New Guinea and shares it’s western border with Papua New Guinea, is football mad and rebellious. The success of the capital Jayapura’s Persipura Club has been a thorn in the side of Indonesia’s Super League. It currently sits 2nd in the Eastern Division rankings, outcompeting far wealthier clubs from highly populated districts of the country. It’s achievements are shunned by the Jakarta-based media, rarely televised or reported on. It’s supporters are fiercely proud, however, with home games a rare opportunity to heckle and rally against Indonesian officials who otherwise control the region, monitoring (and executing) those suspected of pro-independence activities, allowing Indonesia to continue to reap the rewards of West Papua’s minerals and resources. As the world cup kicked off in Brazil, football shirts were being sold everywhere and worn with pride. The flags of the host nation, together with those of Argentina, Spain, Germany and Italy flew from stilted shacks that jut out over the water in the bay of Sorong, the province’s second largest city. At 5am as the opening match between Brazil and Croatia kicked off, crowds hoarded around tv screens displaying fuzzy images streamed from across the globe, spilling out onto dilapidated sidewalks, faces pressed up against the glass outside hotels. I sat in a roadside ‘warung’, drinking strong Papuan coffee with a group of wide-eyed local men. ‘My brother is Neymar,’ one told me, of the Brazilian who is revered here. 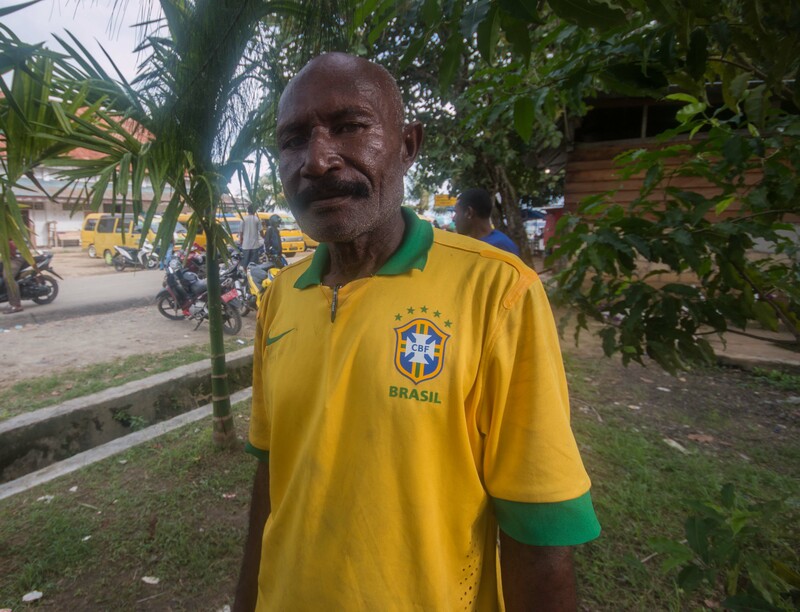 When questioned about why he supported Brazil, the answer, ‘I don’t know’, came with a wide, betel nut-stained smile. Football is a distraction from the hardships of daily life and the talent of West Papuan football is something the Indonesian authorities cannot take away.